LOS ANGELES, Calif. /California Newswire/ — "Little Green" book publisher, Paraphrase, LLC, pledges support for Save The Frogs Day 2016. Did you know there is a "Save The Frogs Day"? You may have read or heard at some point in the last few years about the alarming rate of disappearance of frogs in the world. While you might ask why this is important, frogs are essential to many ecosystems around the world. Frogs eat mosquitoes; provide us with medical advances; serve as food for birds, fish and monkeys; and their tadpoles filter our drinking water. Plus frogs look and sound cool, and kids love them — so there are lots of reasons to Save The Frogs! Frogs are an integral part of the food web. They are bioindicators of environmental disturbances. Frogs produce a wide array of skin secretions, many of which have significant potential to improve human health through their use as pharmaceuticals. And so much more! Save The Frogs Day is April 30, 2016! Conceived and coordinated by SAVE THE FROGS! (www.savethefrogs.com), the world's leading amphibian conservation organization, Save The Frogs Day is the biggest day of froggy conservation and education. The organization's goal for this special day is to encourage the appreciation and celebration of amphibians by people from all walks of life. SAVE THE FROGS! encourages people in countries around the world to organize a Save The Frogs Day event in their own communities, and provides tips for event organizers and educational materials for distribution. Help Save The Frogs by planning your own event or fundraising efforts, and be creative. "Isn't it possible?" is the cornerstone message from one such fundraising effort. All profits from purchases of new print or kindle copies of "LITTLE GREEN" (Paraphrase, LLC 2012) from Amazon.com or via the website http://www.isntitpossible.com/ made on Save The Frogs Day, April 30, 2016, will be donated to SAVE THE FROGS! 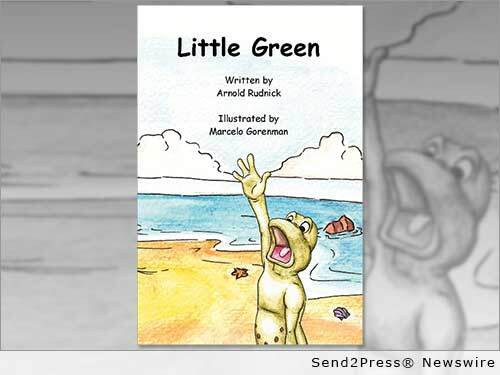 "LITTLE GREEN" (ISBN: 978-0981587974) is a picture-book for 0-7 year olds, written by Arnold Rudnick, with illustrations by Marcelo Gorenman, featuring a little green frog on a quest to be special. He hops around from animal to animal asking 'Isn't it possible?' he can be one of them and do the special things they do. While the reader learns animal groups, skills, traits and sounds, Little Green learns almost anything is possible, but he has to start by being himself. "I hope that someday Little Green and 'Isn't it possible?' will be as familiar to children, and empowering, as 'I Think I Can!' from THE LITTLE ENGINE THAT COULD," Rudnick says. "Reading makes things possible. Reading… and frogs." "We really appreciate the generous support and inspiring message of 'LITTLE GREEN,'" says Michael Starkey, Ecologist and Save The Frogs Day Coordinator at SAVE THE FROGS! "Isn't it possible," Little Green would ask, "that we can save the frogs on April 30, 2016?" SAVE THE FROGS! (www.savethefrogs.com) is a worldwide movement dedicated to protecting the world's rapidly disappearing amphibian species. Visit http://www.savethefrogs.com/day/ for information and history of this ribbiting day, help in organizing you own event and getting it recognized officially in your area, educational materials, and much more. Visit http://www.savethefrogs.com/donations/fundraise.html to learn about other ways you can help. Paraphrase, LLC, is a boutique publishing company promoting literacy with a mission to create thought-provoking media that educates, entertains and inspires. Their motto is "Read a book, Read a mind. "(R) Visit the website at http://www.paraphrasellc.com/ or the "LITTLE GREEN" website at http://www.isntitpossible.com/. Arnold Rudnick worked in feature development at Paramount Pictures and Gary Lucchesi Productions and has written for many television shows, including "The Fresh Prince of Bel-Air," "Star Trek: Voyager" and "The New Addams Family." His first book, "ESPete: Sixth Grade Sense" (www.espete.com) won a silver medal in the Moonbeam Children's Book Awards (2009) and Reader's Favorite Awards (2010) and was a pick in Danny Brassell's Lazy Readers' Book Club (September 2012) (www.lazyreaders.com). Marcelo Gorenman grew up in South America. He taught himself how to draw and was eventually accepted at the prestigious School of Visual Arts in New York City, and later the exclusive 3-D animation program at Sheridan College in Canada. Marcelo has worked in animation and illustration since 2002, in Europe, Canada and the USA.